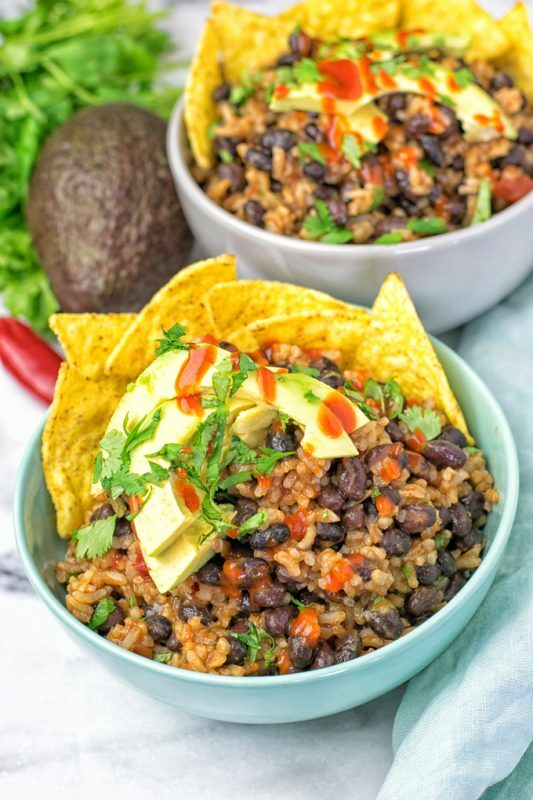 This Vegetarian BBQ Burrito Bowl is full of black beans, spicy garlic, and amazing flavors. It is super easy to make, vegan, gluten free and is everything you ask for in a stunning lunch, dinner, or snack. For regular visitors of Contentedness Cooking, it will be no surprise when I say that I have a fondness for bowl food. It come together real quick, there are warm or cold dishes, breakfast, lunch, or dinner. Whatever your mood is, there is always a bowl for you. I’ve already given you a couple of bowl recipes that have become so popular. My Breakfast Bowl [vegan, gluten free] is probably the biggest star among them. But there is also the Cauliflower Rice Buddha Bowl, and so many more. Feel free to take a good look around and explore them all. 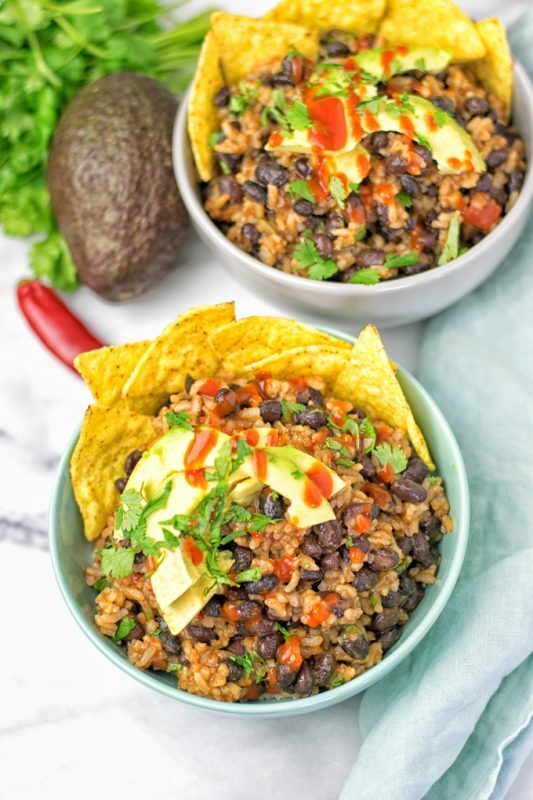 Get in line and excited for this Vegetarian BBQ Burrito Bowl. 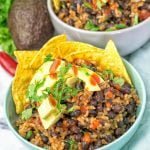 It’s super easy, packed with amazing flavors, mouthwatering, accessible the whole year, satisfying, and a must make not only for bowl lovers like me. You don’t believe me how easy this is? You might think I’m just kiddin’ you. But for real there is no other magic. No complicated ingredients, just honest and delicious food here, friends. Let’s start: cook the rice according the directions. This will depend on your choice of rice, so check it carefully. 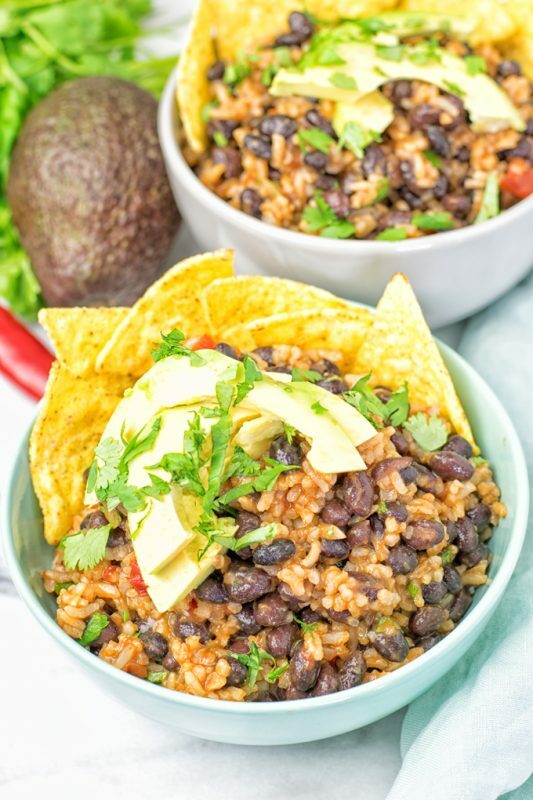 While it’s cooking, make the black beans, as described in my Mexican Fiesta Cauliflower Rice. Next and already last: assemble the bowl. Just mix BBQ sauce, rice, beans, cumin, avocado slices, season with salt and pepper. Garnish or serve with some tortilla chips (optional) for a delicious and satisfying crunch. That’s all what you have to do, straight forward and downright easy. You might notice this entirely dairy free and plant based recipe has only 5 ingredients. It’s also great for make ahead preparation and to bring along on work like all these 10 Best Easy Vegan Work Lunch Recipes. Or to BBQs, and genreally whenever you need something quick. This recipe will be gone and fully devoured in no time. For that it won’t matter if there are vegans, vegetarians, or meat lovers. 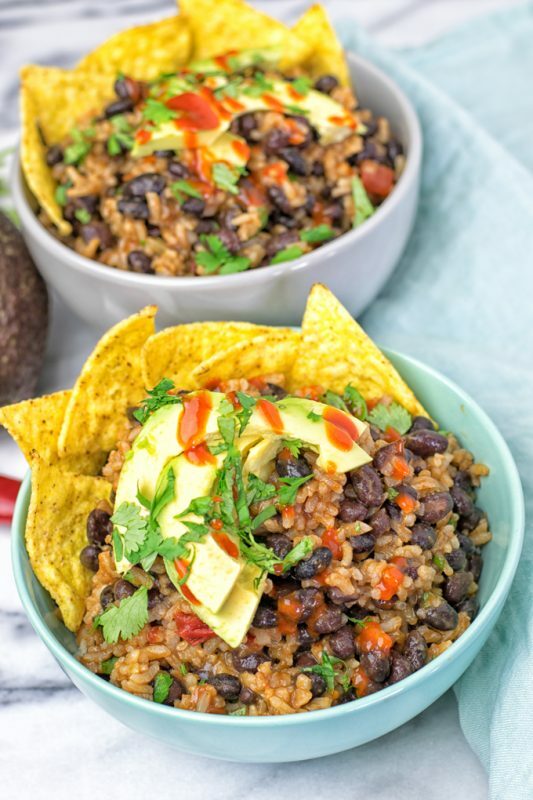 No matter what diet direction you follow, you will love this Vegetarian BBQ Burrito Bowl. It will hit the spot for everyone. 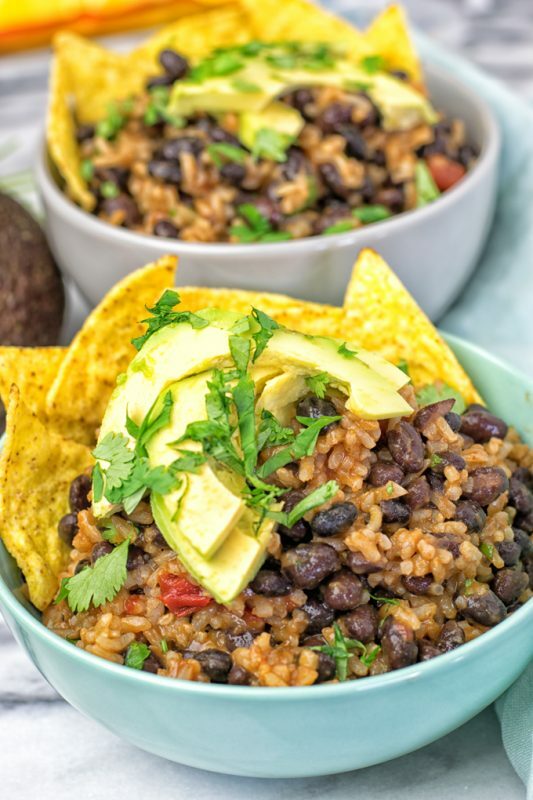 I can happily confirm you won’t miss anything, thanks to black beans which add protein and a meaty texture to the bowl. One of the advantages when making bowl food is you never get bored or tired of it. You can do so many variations: sweet, savory, you get the picture. It’s not only delicious, nutritious, easy and will never disappoint. It’s also always beautiful to look at. Just think of the colors, the presentation. Oh yes, feed your eyes. So here’s a fun project for me and you. How to make your custom bowl: start with the base, that can be rice, quinoa. Then choose proteins, like beans, lentils, maybe some greens. Finally add your favorite toppings: avocado, nuts, and then top with more sauce. But what the way I make my bowls most often is the lazy way. Just mix all the things together, top with more sauce, ready. With these hints you can make every fun bowl project. If you give this a try, snap a picture love seeing all your fancy or lazy bowls on Facebook or Instagram with a tag. Cook the rice according the manufacturer’s directions. 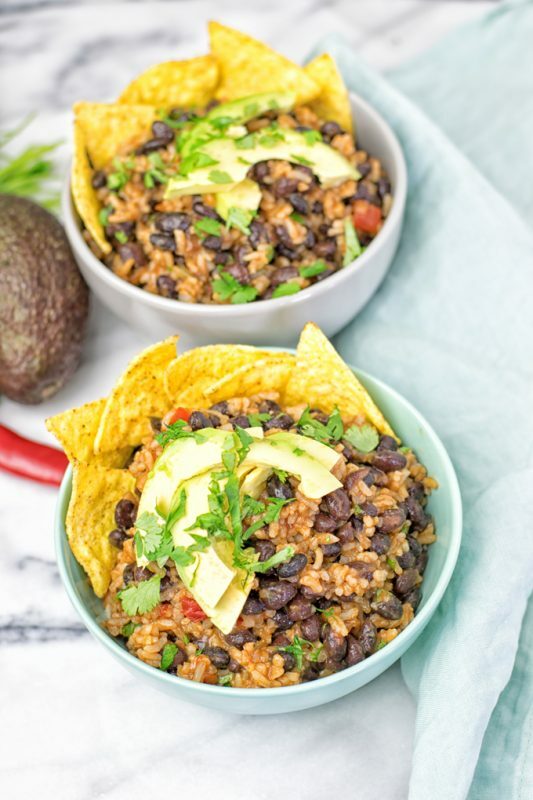 While it’s cooking, make the black beans, as described in my Mexican Fiesta Cauliflower Rice. Assemble the bowl. Just mix BBQ sauce, rice, beans, cumin, avocado slices, season with salt and pepper. Garnish or serve with some tortilla chips (optional) for a delicious and satisfying crunch.